Here's the artbook to the popular game that won the hearts of many ladies, and some guys. The World of Professor Layton is the English translated edition of the Japanese artbook that was published in April 2013. The paperback book has 192 pages. This companion artbook features plenty of content. There are interviews with the staff, survey and questionnaire results from fans, artworks, character profiles, stories, timeline of the game, merchandise, marketing visuals and storyboards. Interviews are with president and CEO of Level-5 Akihiro Hino, author of Atama No Taisou Akira Tago, Yo Oizumi and Maki Horikita who are the voice actors for Professor Layton and Luke Triton. There's also a Q&A roundtable with selected staff answering selected questions from fans. There was a special website set up with a survey and the results and answers are in this book. Questions asked are like who's your favourite character, who would you date, which character you want to be, what's your favourite game, favourite animal from the game, and many more. It's quite fun to read what the fans have written. There's also a caption contest with funny entries. The character art are from the game but there are also concept art and sketches. 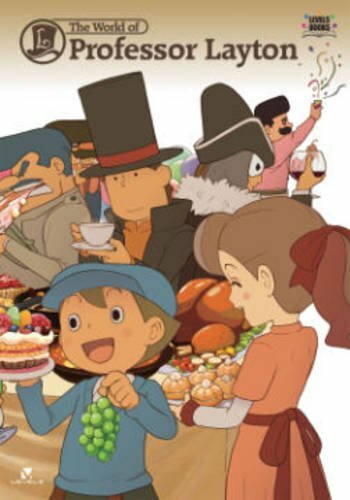 I love the cartoon style of all the characters, especially the beady eyes of Professor Layton. All characters come with a profile and design commentary. The location artworks are fantastic but they are printed so small just like how many other Japanese artbooks do. It's quite frustrating to see something beautiful printed at such small sizes. Overall, the artworks are lovely and there are so much information about the games. It's definitely a must buy for fans.